What type of pigment do we use? We use iron oxide pigments, as they have been shown to be the safest pigment. Anything that is vegetable-based, organic or natural is the riskiest pigment. Most natural products in vegetables and herbs can cause horrible allergic reactions when depositing them in the skin. A topical numbing cream is applied to the treated area to minimize discomfort, followed by a liquid anesthetic that controls swelling and continues numbing for the full procedure. Microblading is perfect for those who want to fully reconstruct, define, cover gaps or fill in over plucked brows. Microblading is done with a special pen that has a unique tip with needles in a particular shape that penetrates the skin, slicing in color for a hair-like design pattern. One-by-one and by hand, the technician creates the hair strokes until the brow is complete. A microblade procedure lasts 6 month to 1 year depending on color. The procedure is done by hand versus the power of a machine. Due to the thin quality of the hair stroke, they can easily fade over a lesser period of time. The lasting results of this procedure depend on the person’s body chemistry, use of active skincare products and treatments, and UV exposure. A yearly touchup is recommended to refresh the color and detail of the initial procedure. Microblade Fusion combines machine-grade hair strokes and shading, along with the thinner microblade hair strokes; thereby, achieving the best of both worlds. This is the most popular procedure as it gives the look and effect of microblading with the longevity of a machine-created brow. Brows that are done with a permanent makeup digital machine tend to drive the color in deeper and more evenly. These machines have sensors to identify depth and needle speed. This technique is ideal for individuals who have fine lines, age spots, scar tissue or thicker skin in the brow area since this can be problematic when depositing color or getting an even color application. During the initial consultation, the brow shape, technique and color is determined. 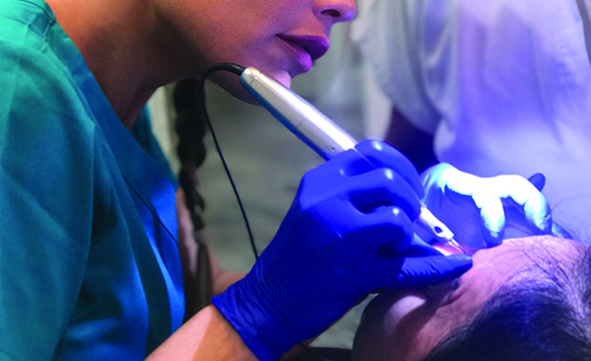 During the microblading fusion procedure, a permanent makeup digital pen will be used to establish the majority of the shape by diffusing a color in the skin using a combination of different techniques. A special microblading pen is then used to slice in individual, thin hair strokes in the front and end of the brow to complete the procedure. Most often, the technician will vary the color application to achieve a more natural and dimensional brow. A Microblade Fusion procedure lasts 1-3 years depending on color. The lighter the brow color, the more often the touchups. The lasting results of this procedure depends on the person’s body chemistry, use of active skincare products and treatments, and UV exposure. A yearly touchup is recommended to refresh the color and detail of the initial procedure. During the initial consultation, the brow shape, technique and color is determined. 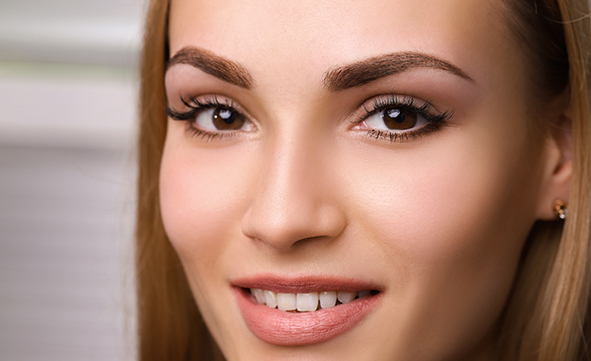 During the eyebrow procedure, a permanent makeup digital pen will be used to establish the initial shape by establishing predefined borders drawn on by an eyebrow pencil. The technician will create hair strokes with a specialized machine tip, layering hairstrokes in blended tones to achieve a more natural and dimensional brow. A Permanent Eyebrow procedure lasts 1-3 years depending on color. The lighter the brow color, the more often the touchups. The lasting results of this procedure depend on the person’s body chemistry, use of active skincare products and treatments, and UV exposure. A yearly touchup is recommended to refresh the color and detail of the initial procedure. Permanent Makeup Lash Line Enhancement is a way to define your eyes without an eyeliner look. Many clients feel they have left the definition to their eyes due to light eyelashes or eyelash loss. This technique is a great way to add definition that looks natural. Permanent Makeup Lash Line Enhancement is done with a digital pen machine. This allows the technician the consistency of the machine to deposit color pigment into the lash line. This is a pointillism method which dots the pigment at the base of the eyelashes. This technique is perfect for those who do not want a linear look and want shading to give an illusion of thicker eyelashes or more eye definition. Permanent Makeup Lash Line Enhancement lasts 2-5 years. 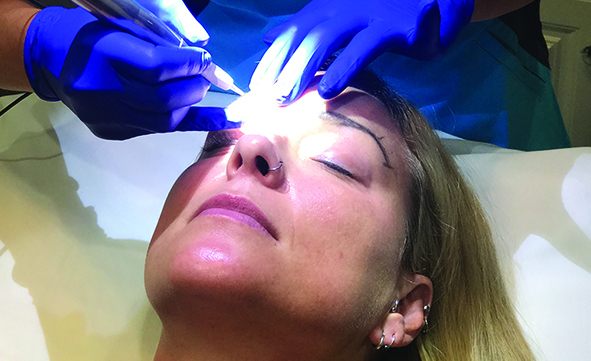 The longevity of this procedure depends on the person’s body chemistry, use of active skincare products, UV exposure or use of detergents to remove eye makeup. Typically, the procedure needs to be refreshed every 3 years as natural fading occurs over time. Permanent Eyeliner is a form of waterproof, eye-defining liner that can take the mess out of applying your eyeliner every day. Pigment is deposited in and above your lash line to create a perfectly applied liner look that is smudge-proof. 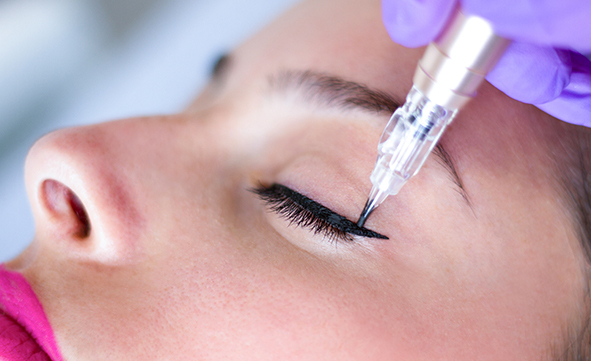 If you apply eyeliner every day, then you are the perfect candidate for this procedure. Imagine waking up without the hassle of your eyeliner routine each day. Permanent Makeup Eyeliner is done with a digital pen machine. This allows the technician the consistency of the machine to deposit the desired pigment color into the lash line. The technique used depends on the machine tip selected and the desired result. You can choose a more linear look or a shadow-diffused look. The colors options are endless, although most choose an espresso or black shade. You can start with a very thin application of liner and over time keep adding until you are comfortable with the thickness. Less is more and we always encourage this philosophy when having an eyeliner procedure. No more tired and undefined eyes, with just a simple and strategic application of color! 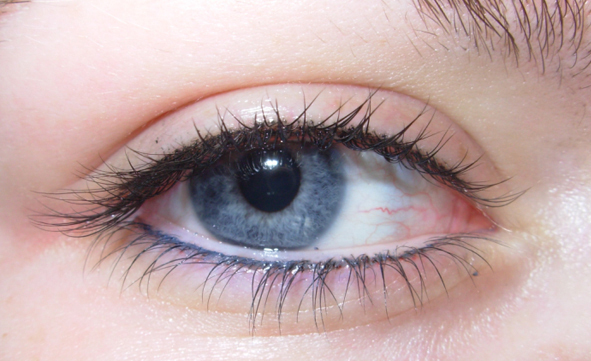 Permanent Makeup Eyeliner lasts 2-5 years. The longevity of this procedure depends on the person’s body chemistry, use of active skincare products, UV exposure or use of detergents to remove eye makeup. Typically, the procedure needs to be refreshed every 3 years as natural fading occurs over time. Lip liner is done with a digital pen machine that allows the technician the consistency of the machine to deposit the desired pigment color into the lip line. 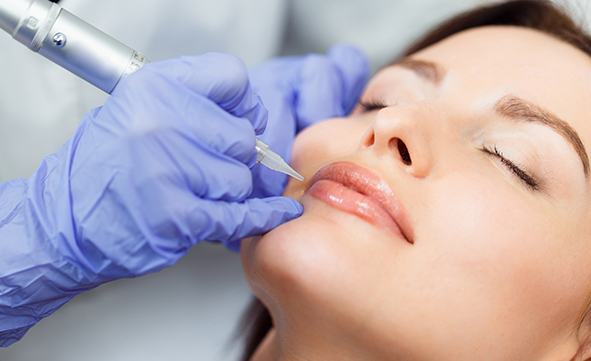 This procedure is ideal for those clients who are losing their vermillion border and no longer have that crisp lip line. More natural colors are recommended for lip liner as it will give you the flexibility of wearing additional lip sticks and glosses or nothing at all. The permanent lip liner we create will give the appearance of the lip looking fuller as well as more defined. Permanent Makeup Lip liner is done with a digital pen machine. This allows the technician the consistency of the machine to deposit the desired pigment color into the lip line. The technique used depends on the machine tip selected and the desired result of the lip liner (thin, diffused or thicker). You can choose a more linear look or a softer look for the lip line. Typically, this will take multiple applications of color (2-3) since the lip only retains a percentage of the color each time. It is best explained that you are building the color in the lip over time as the color is deposited into the lip and not color lying on top of the lip. A huge benefit is the color is waterproof and doesn’t rub off, which is well worth it! Permanent Makeup Lipliner lasts 3-6 years and sometimes even longer. The longevity of this procedure depends on the person’s body chemistry, use of active skincare products, UV exposure or use of detergents to remove cosmetics. Typically, the procedure needs to be refreshed every 3 years as natural fading occurs over time. The Sunburst lip color is done with a digital pen machine that allows the consistency of the machine to deposit the desired pigment color into the lip line and then shaded into the natural lip. This procedure is ideal for those clients wanting a fuller lip with using the illusion of color and shading. Any lip color can be chosen, but all lip colors tend to heal softer and lighter as pigments deposited in the lip only retain a percentage of the color. Skin tone is considered during the initial consultation so a color that will give the lip more dimension can wisely be considered by both the client and technician. Permanent Makeup Sunburst Lip Color is done with a digital pen machine. This allows the technician the consistency of the machine to deposit the desired pigment color into the lip line. The technique used depends on the machine tip selected and the desired result of the lip liner (thin, diffused or thicker). You can choose a more linear look or a softer look for the lip line and then a lighter version of that color is chosen for the shading inside the lip line. Typically, this will take multiple applications of color since the lip only retains a percentage of the color each time. It is best explained that you are building the color in the lip over time as the color is deposited into the lip and not color lying on top of the lip. A huge benefit is the color is waterproof and doesn’t rub off, which is well worth it! Permanent Makeup Lip liner lasts 3-6 years and sometimes even longer. The longevity of this procedure depends on the person’s body chemistry, use of active skincare products, UV exposure or use of detergents to remove cosmetics. Typically, the procedure needs to be refreshed every 3 years as natural fading occurs over time. Full Lip Color is done with a digital pen machine that allows the consistency of the machine to deposit the desired pigment color into the lip. 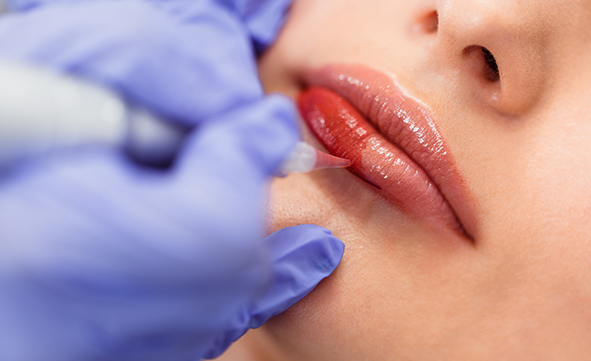 This procedure is ideal for those clients who feel their natural lip color is too light or faded and want a more enhanced lip color that brightens their complexion. Any lip color can be chosen but all lip colors tend to heal softer and lighter as pigments deposited in the lip only retain a percentage of the color. Skin tone is considered during the initial consultation, so choosing a correct undertone that aligns with the natural complexion is very important since a harmonizing color can bring the youthfulness and fullness back to the lip. Permanent Makeup Full Lip Color is done with a digital pen machine. This allows the technician the consistency of the machine to deposit the desired pigment color into the lip. The technique used depends on the machine tip selected and the desired result of the lip color (diffused or more opaque). You can choose a softer look for the lip color and then a lighter version of that color is chosen for the shading inside the pucker of the lip. Typically, this will take multiple applications of color since the lip only retains a percentage of the color each time. It is best explained that you are building the color in the lip over time as the color is deposited into the lip and not color lying on top of the lip. A huge benefit is the color is waterproof and doesn’t rub off, which is well worth it! 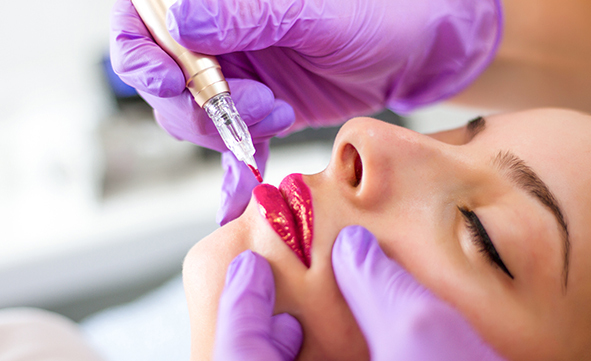 Permanent Makeup Lip Color lasts 3-6 years and sometimes even longer. The longevity of this procedure depends on the person’s body chemistry, use of active skincare products, UV exposure or use of detergents to remove cosmetics. Typically, the procedure needs to be refreshed every 5 years as natural fading occurs over time. All Permanent Makeup needs to be refreshed over a period of time as we are depositing color into live tissue that renews itself. This also is affected by lifestyle choices such as sun exposure, stress, medication and illnesses. Another thing to consider is how active the skincare products have become over the last 10 years. Products sold today in the skincare market, especially medical grade products, are making cellular changes and impacting dark spots, fine lines and wrinkles. So, it would just make sense that it affects pigments deposited in the skin.